Quetzalcoatl. We've all heard the name before. "He's that Feathered Serpent of Ancient Mexico". However, that only answers the WHAT. Ask, WHO he was, and you might get an answer along the lines of an unintelligble stare; or the standard response, "Yeah. He was the guy who was suppose to return from the East to reclaim his power, but the Indians mistook Cortes for him instead". Though it might seem a simple enough question, a far more involved and complicated answer is necessary. First of all, Quetzalcoatl was a god of such importance and power that nearly no aspect of everyday life seemed to go untouched by him. Secondly, as a historical figure, his actions would nor could not be contained by the History and thus eventually evolved into myth. And as a legend, he would signal the end of mortal kingship. An interesting phenomenon that distinguished Quetzalcoatl is that despite the fact he is not the most powerful of gods within the Mesoamerican pantheon, or one of the eldest, he is nonetheless an integral part of the system. This was partially accomplished by his ability to integrate himself so securely to attributes of his fellow brethren, to such an extent that it is virtually impossible to tell if Quetzalcoatl was the true originator or vise versa. Hence, to establish a single definitive personality to a god is extremely difficult. Lastly, it must be kept in mind that despite Quetzalcoatl being an Aztec name, the cultures preceding them had their name for him as well, and applying their own unique attributes to him. Consequently, Quetzalcoatl is related to many names and incarnations, and seems to play a prominent role in a pantheon of virtually all the other Mesoamerican deities. 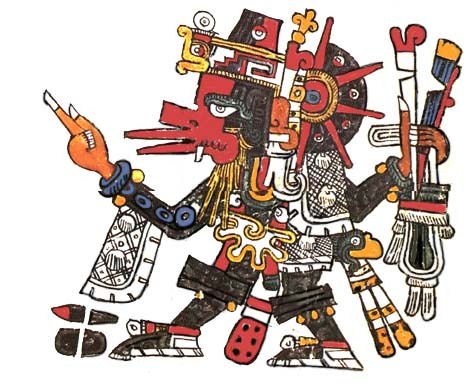 Quetzalcoatl himself goes by the names of Gukumatz, Nine Wind, and Kukulcan among others. These are the most common names found in the general Aztec and Mayan cultures, with Quetzalcoatl maintaining a host of avatars with whom he is intimately connected with or represented by. There are also certain gods that Quetzalcoatl is involved with most of the time as well, such as Xolotl, Tlaloc, Xipe, and Tezcatlipoca. These "upper level" gods are either contrary, complimentary, or both at the same time towards Quetzalcoatl, creating a sense of duality around these myths. Quetzalcoatl (Classical Nahuatl: Quetzalcōhuātl pronounced [ke.ʦal.ˈkoː.waːtɬ]) is an Aztec sky and creator god. 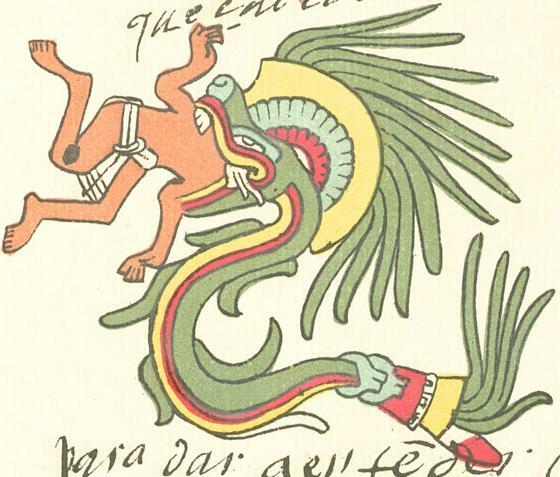 The name is a combination of quetzalli, a brightly colored Mesoamerican bird, and coatl, meaning serpent. The name was also taken on by various ancient leaders. Due to their cyclical view of time and the tendency of leaders to revise histories to support their rule, many events and attributes attributed to Quetzalcoatl are exceedingly difficult to separate from the political leaders that took this name on themselves. Quetzalcoatl is often referred to as The Feathered Serpent and was connected to the planet Venus. He was also the patron god of the Aztec priesthood, of learning and knowledge. Today Quetzalcoatl is arguably the best known Aztec deity, and is often thought to have been the principal Aztec god. However, Quetzalcoatl was one of several important gods in the Aztec pantheon along with the gods Tlaloc, Tezcatlipoca and Huitzilopochtli. Several other Mesoamerican cultures are known to have worshipped a feathered serpent god: At Teotihuacan the several monumental structures are adorned with images of a feathered serpent (Notably the so-called "Citadel and Temple of Quetzalcoatl"). Such imagery is also prominent at such sites as Chichén Itza and Tula. This has led scholars to conclude that the deity called Quetzalcoatl in the Nahuatl language was among the most important deities of Mesoamerica. The Feathered Serpent deity was important in art and religion in most of Mesoamerica for close to 2,000 years, from the Pre-Classic era until the Spanish conquest. Civilizations worshiping the Feathered Serpent included the Mixtec, Toltec, Aztec, who adopted it from the people of Teotihuacan, and the Maya. The cult of the serpent in Mesoamerica is very old; there are representations of snakes with bird-like characteristics as old as the Olmec preclassic (1150-500 BC). The snake represents the earth and vegetation, but it was in Teotihuacan (around 150 BC) where the snake got the precious feathers of the quetzal, as seen in the Murals of the city. The most elaborate representations come from the old Quetzalcoatl Temple around 200 BC, which shows a rattlesnake with the long green feathers of the quetzal. • He was associated with a new star. • He taught the practice of baptism. • He was associated with the cross. • He was a symbol of death and resurrection. • He sent disciples to preach His word. • He prophesied of future events. • He promised He would come a second time. • He was the Creator of all things. • He caused a great destruction in Central America circa 34 A.D.
• His children will become lords and heirs of the earth. Taken together, these beliefs clearly mirror the accounts of Jesus Christ’s birth, death and ministry in Palestine that are recorded in the New Testament. Aztec. There exists two accounts to how the Aztecs saw the Creation myth. One comes from the Legend of the Suns and the other from the Latin Vatican Codex 3738. Nahui Ocelotl (4 Ocelotl): Lasted 676 years, ruled by Tezcatlipoca, element was Earth and destroyed in the year Ce Actal (1 Reed) by ocelotl. Nahui Ehectal (4 Wind): Lasted 364 years, element was Wind, and destroyed in the year Ce Tecpatl (1 Flint) by wind. Nahui Quihahuitl (4 Rain): Lasted 312 years, element was Fire, and destroyed in the year Ce Tecpatl by fiery rain. Nahui Atl (4 Water): Lasted 676 years, element was Water, and destroyed in the year Ce Calli (1 House) by water. 5.Ollin Tonatiuh (Movement of the Sun): Began ? Will be destroyed by ? in the year ? Matlactli Atl = Clalchiutlicue presided, lasted 4008 years, and destroyed by Water. Telquiyahuillo = Xiuhtecuhtli (god of fire) presided, lasted 4081 years, and destroyed by Fire on the day Chichunahui Ollin (9 Earthquake). Tzontilic = Occurred 5042 years ago. Tula is founded and Topiltzin Queztalcoatl is born to the virgin Chimalman. People killed by a blood rain. Similar concept, but with only 4 eras. Each eon measured 13 baktuns totaling approximately 5200 years. Using the Thompson correlation, Michael D. Coe has calculated that the beginning of the present era was in 3114 BC while its end is on December 23 2012 AD. 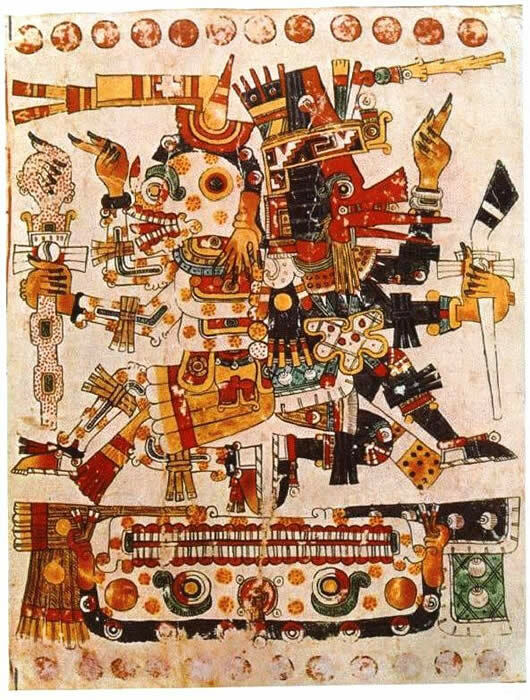 Aztec: A primordial serpent was divided into three sections and each section had a special domain -- the Head held the thirteen levels of Heaven; the Center was the Earth; and the Tail made up the nine levels of the Underworld. 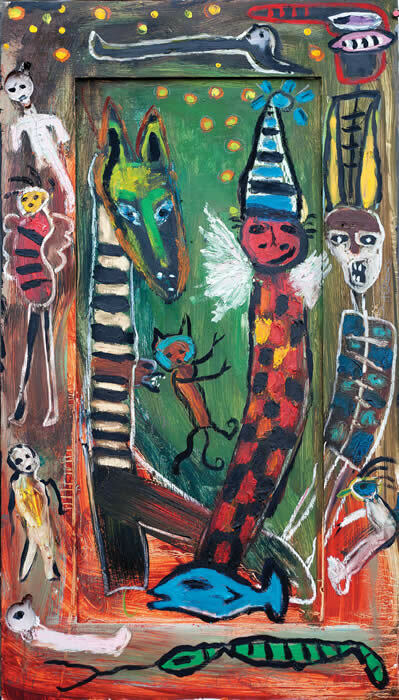 Each of the three had their own cardinal directions and were connected at the center. Maya: The primordial crocodile rests in a pool filled with water- lilies. On its back is the Earth. Flat, it has four corners corresponding to four colors. (White = North, Yellow = South, East = Red and West = Black; Green is associated with the center). The Sky were created form a double- headed serpent. On the body of this serpent were the paths crossed by the sun, moon, planets, etc. The Heavens were thirteen tiered. 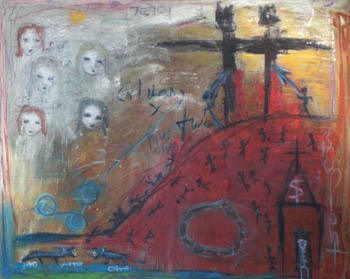 It was supported either by four skybearers or five trees ( four in each cardinal direction and one in the center). One god was assigned to each level. The Underworld also assigned one god to each of its nine levels. Throughout Mesoamerica a similar notation of time called the Calendar Round was used. It was based off of the coordination of two wheels, one contianing the numbers 1 through 20 and the other containg the thirteen day names, that combined to form the tonalpohualli (Almanac Year). Trecena refers to the groupings of the thirteen days.